A Mutant Digimon which Jogress-evolved from Stingmon and XV-mon. 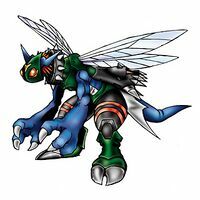 A chimera of a dragon and an insect, it is a Digimon which possesses the name Terrible Bee. 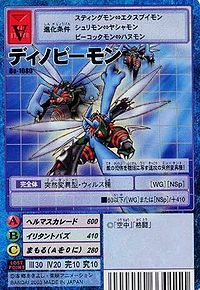 It is hard to classify its species as either a Dragon type or an Insect type, but its Insect nature is more pronounced. 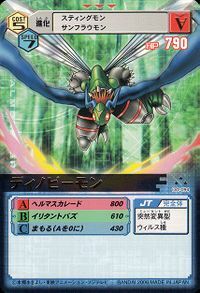 It flies through the sky with its four wings, and accurately perceives the opponent with the compound eyes on its head, so it can reliably choke the life out of its opponent. Also, Dinobeemon possesses a considerably ferocious personality. Its Special Move is the Dance of Hell in which its nimble movements leave behind afterimages while it chops up the opponent (Hell Masquerade). 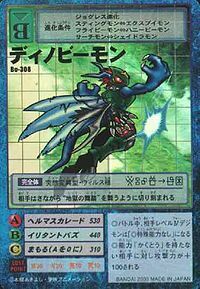 Hell Masquerade  ヘルマスカレード Heru Masukurēdo Slashes at foe with its claws in a "Dance of Hell," moving so fast it leaves afterimages. 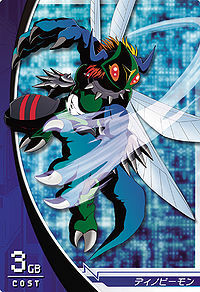 Dinobeemon is the Partner Digimon of Ichijouji Ken. Evolves without Jogress with XV-mon. 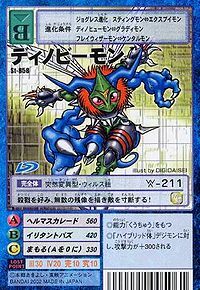 Can evolve to Gran Kuwagamon. Can be evolved from Stingmon if level is over 26. It can evolve to Gran Kuwagamon if above level 53. 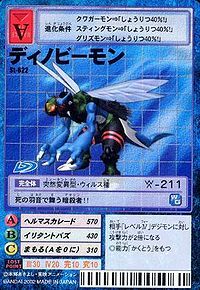 Can be evolved from Flymon if above level 41, Dragon EXP 8800, and already befriended Dinobeemon. 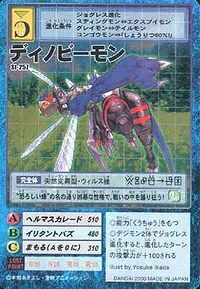 Can evolve to Imperialdramon (Black) if above level 60, attack 315, and Dragon EXP 20000. 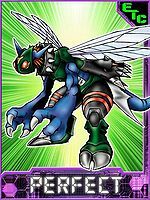 Dinobeemon is available as a Digimon Medal. 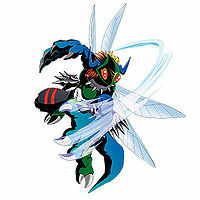 Evolves from Stingmon Jogressed with XV-mon, one of the playable Partner Digimon. It evolves to Gran Kuwagamon when Jogressed with Atlur Kabuterimon (Red). It lives up to its name of "The Fearsome Bee" with its wild character, dancing madly in the midst of the battle! This assassin dances with the buzz of death!! 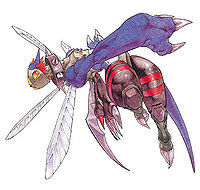 This massacre-loving Digimon paints countless afterimages of itself as it slices the opponent apart! Sporting a ferocious personality, this dragon-insect chimera brings down its prey without fail! It slices the opponent up while dancing a 'Dance from Hell'. 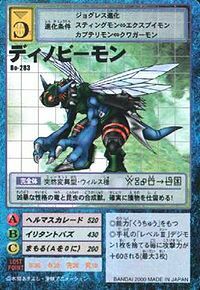 This swift-attacking mutant reflects the fear of its enemies in its compound eyes! The Jogress evolved form of Stingmon and XV-mon. The nature of an insect is strongly exhibited in it. It spots the enemy using its compound eyes, and slaughters its prey with its violent movements.